Congratulations! 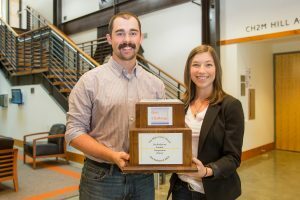 The Oregon State University student team of Nathan Jones and Alessandra Hossley took first place, earning the Mohr-Circle Award in the 2017 GeoPrediction competition at the annual meeting of the ASCE Geo-Institute. Oregon State has won first place three out of the past four years in the competition, taking home the first place trophy in 2014, 2016, and 2017. The objective of the GeoPrediction competition is for student teams to develop an accurate prediction of geotechnical behavior given detailed information regarding subsurface, boundary, and initial conditions, as well as the geotechnical, structural, and hydraulic loading. After developing their prediction, student teams present their methodology and findings to a panel of judges comprised of geotechnical practitioners and faculty. The student team of Nathan Jones and Alessandra Hossley took first place, earning the Mohr-Circle Award in the 2017 GeoPrediction competition at the annual meeting of the ASCE Geo-Institute. 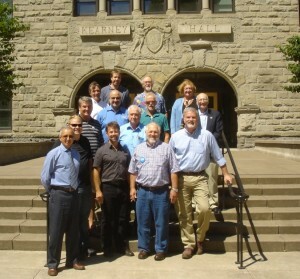 Advised by Armin Stuedlein, associate professor in geotechnical engineering, Jones and fellow team member Hossley, who is pursuing a dual bachelor’s degree in civil engineering and forest engineering, began working on their prediction in September 2016 and submitted their detailed report in January. OSU was one of eight teams selected to attend the conference and compete for the Mohr-Circle Award. “This was my first time participating in the GeoPrediction competition and I enjoyed the experience of synthesizing a variety of data for the prediction as well as the overall experience of presenting at a professional conference,” said Hossley. University of Texas at Arlington placed second and the Middle Eastern Technical University of Ankara, Turkey placed third. View the student team research poster.